Praying mantises (Prey-ing mant-is) is also called praying mantid, but is sometimes misspelled as "preying" mantis. It eats mainly flies and other common bugs, and, because of that, there is a legal fine for killing or hurting them purposely. The longest one measures about 18 inches, which is almost the length of the average adult's forearm! It is recommended to not catch or tame praying mantises to increase their population. 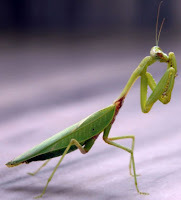 Praying mantises are usually light green, but there is a species that are light brown.